Sånd simply has to be felt to be believed. It oozes when you squeeze it, yet you can sculpt it and it will hold its shape. And watching it flow is simply mesmerizing. Sånd is non-toxic and never dries out. 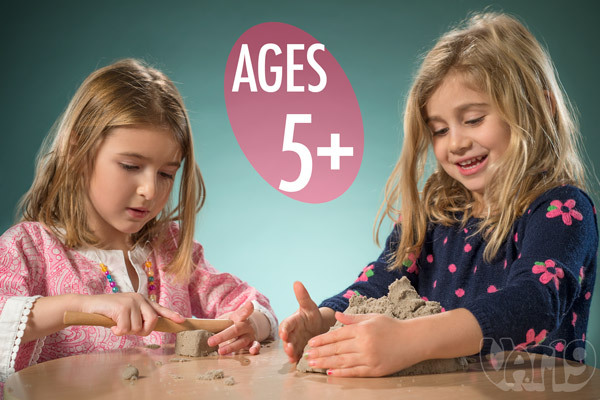 Ages 5 and up. 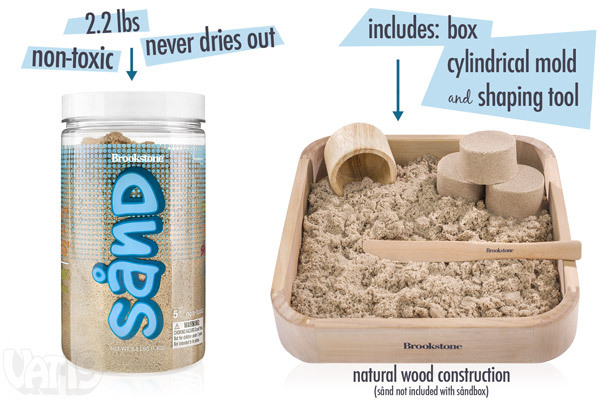 Dimensions (Sandbox): 9.5" x 9.5" x 1.5"
Bring the beach indoors with Sånd! 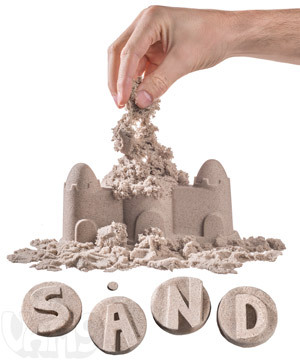 Sand is virtually mess-free because it sticks to itself and not your hands. Compress a bit of Sand and it becomes an impromptu tablet. Draw, sketch, doodle, and write to your heart's content. Not surprisingly, the official Vat19.com pen is amazingly adept at this task. You can draw, sketch, write, and erase in compacted Sånd. And the best implement for doing so? 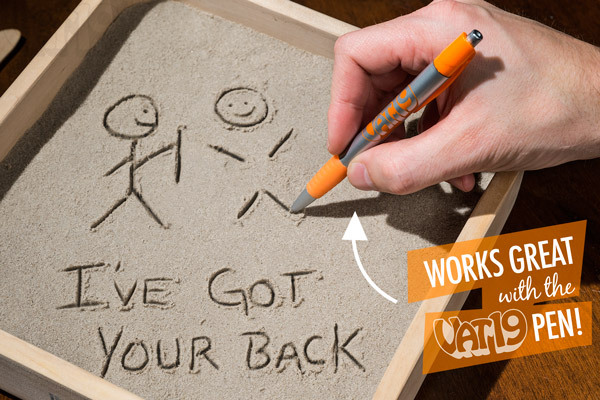 Keep a few jars of Sand on your desk as a creativity-inducing and stress-relieving Swiss Army Knife. 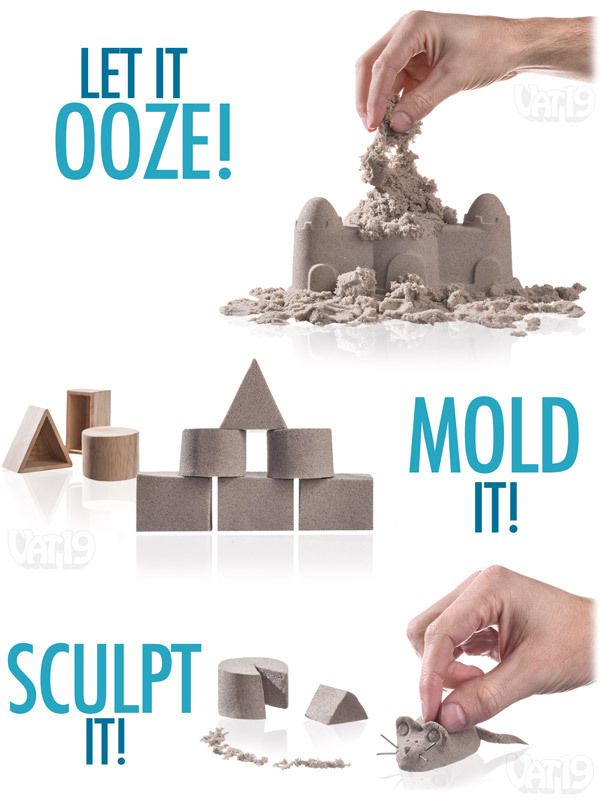 You can squeeze it like a stress ball, relax by watching it flow through your hands, and get inspired while using it as a building and sculpting material. Sand is a perfect meditative stress reliever for the office. Kids will love this stuff! After we got the shot of Jamie's kids playing with Sånd, we couldn't get rid of them! Eventually, we had to turn off all the lights in the studio to get them to stop playing with this stuff. Kids absolutely love Sånd. 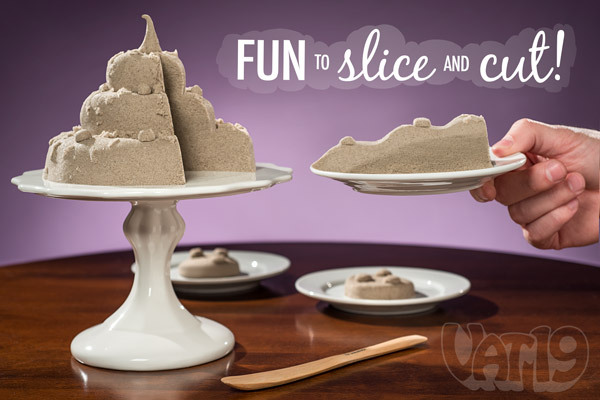 Sand is designed for ages 5 and up. Get the Sånd... and the box! 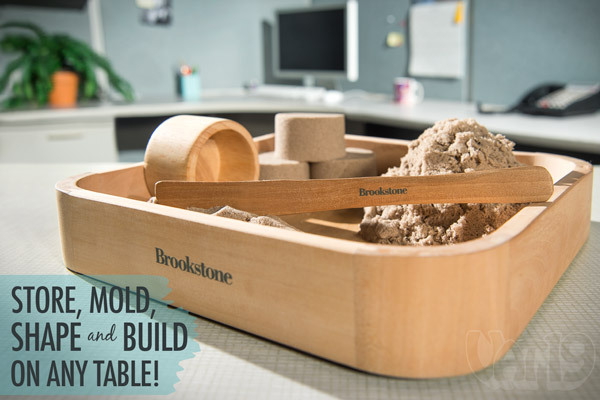 Sand by Brookstone is currently available in a 2.2-pound (1 kg) jar which is definitely enough for two kids to share. However, if you want to create large or complex structures, we would definitely recommend 4-6 jars. 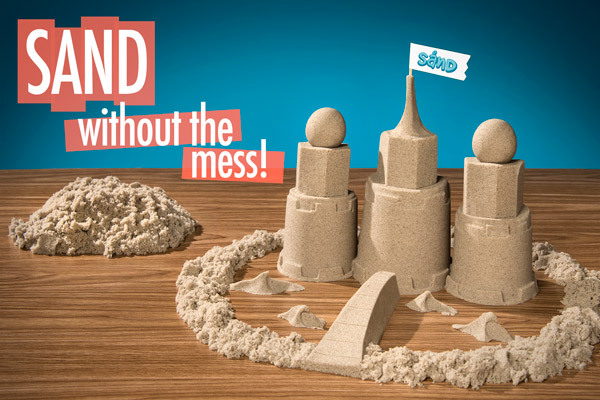 We also recommend the SåndBox for those wishing to keep their Sand on a desk. It's a 9.5" x 9.5" tray made from natural wood that also includes a cylindrical mold and a knife-like (not sharp) shaping tool. Please note: The SåndBox does not include any Sånd. Please note that the Sandbox accessory does not come with any Sand. Sånd is now available in two vibrant colors: blue and green. This begs the obvious question: "What color should I purchase? Original? Blue? Green?!" We think you know the answer: All three, son! Please note that all colors are available in 2.2-pound jars. The only difference is the color! You can't go wrong with any of the colors of Sånd. Question: How come you're selling a Brookstone product? Answer: Because Sånd is awesome. We know Brookstone is a "rival" retailer, but they clearly know how to make some cool stuff. Plus, they kind of begged us to make a video, and flattery will get you very far in this world. Question: Does it really never dry out? Answer: Yep. Sånd will never dry out. It's pretty amazing stuff. Question: Why do you sometimes spell it Sånd and sometimes Sand by Brookstone? Answer: Search engine optimization. Hey, just keeping it real, y'all. Question: Seriously, though, does it make a mess? Answer: No! We played with it non-stop in the studio for about two weeks while taking our photos and shooting the video and it was super easy to clean up. Question: How much would I need to cover my body in Sånd? Answer: A lot. We would guess you'd need about 200 pounds (approximately 90 jars). Maybe stick to tabletop Sånd activities?